– or lay your hands on one of the other fabulous perks on offer! We’ve just added three NEW perk items! Incredible artist Eeva, who created TORn Book Club’s logo, has drawn two amazing images of Mirkwood’s own party elf, Thranduil. 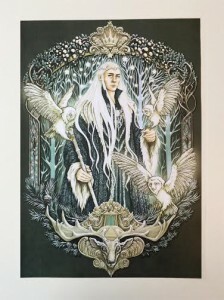 There are only NINE prints available of each of her two illustrations (‘Dark Thranduil’ and ‘Mirkwood in Winter’), and each will be signed by Eeva. 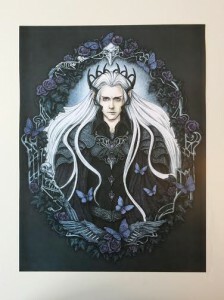 Elf lovers should snap them up before they’re gone! See the ‘Thranduil Special’ perks and choose which one you want – or get them both! “How far would you go to save your family? 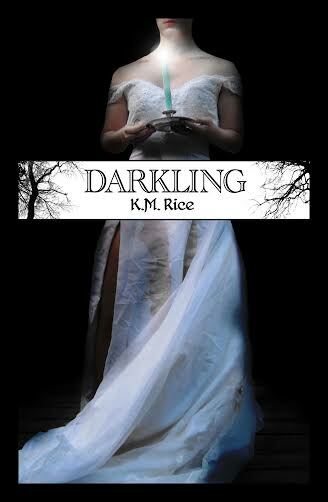 You could have a copy of this book, signed and inscribed to you by Kellie/Kili – just pledge for the ‘Happy Haunted Hobbit’ perk! Later today, party planners will be joining staffer Sarumann on his TORn Book Club to chat about what we have lined up for The One Last Party – tune in at 12noon PST today to hear more, or to ask us questions! You can also leave questions or comments for us on the ‘Comments’ page of the Indiegogo campaign – where you can read about all the exciting perks available. We are so close now – and every little pledge helps. Don’t forget, any pledge made before 11pm GMT today (Jan 11th) enters you in the draw to win the stunning Dragon Bodice created by Marie Porter Costuming! Even a pledge of $1 qualifies you for this giveaway – and helps us get nearer to our goal! Let’s celebrate together the Fellowship of Fans! Our One Last Party fundraiser on Indiegogo is almost 80% funded and we’re pretty stoked!